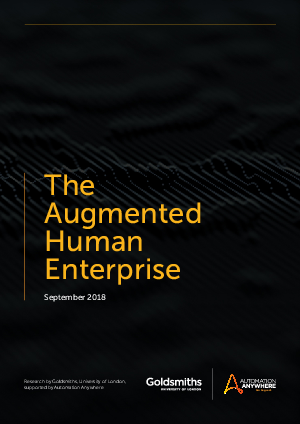 The Augmented Human Enterprise is an independent academic study into the reality and future of automation and AI technologies in the workplace. The future impact of automation and AI on businesses and the people working within them is under constant debate. Advocates hail a future utopia, detractors foresee our dystopian demise. But what's the reality today? A team of academics at Goldsmiths, University of London set out to investigate the real-life impact of automation on work and found that augmented workplaces–those with collaboration between human and machines–score 33% higher on factors deemed to make a workplace more human.